While in the Mississippi State Archives tracking down Abbott Ferriss's beautiful photographic portraits of musicians from 1939, author Harry Bolick discovered, to his amazement, a treasure trove of earlier fiddle tunes in manuscript form. Since then he has worked to understand how this collection came to exist and be set aside. With Stephen T. Austin, Bolick has transcribed the subsequent 1939 audio recordings. 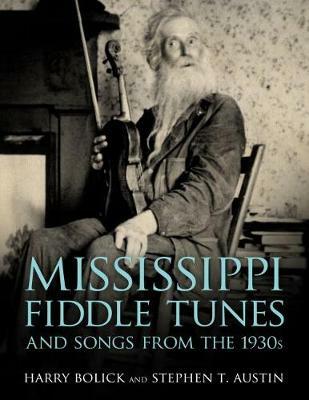 Mississippi Fiddle Tunes and Songs from the 1930s presents the history of the collecting work, with over three hundred of the tunes and songs and a beautiful selection of period photographs. "There's really no way to fully describe this wonderful historic collection. The music, transcriptions, stories, photos, maps, and even the website support www.mississippifiddle.com--this is a must-have source for tunes, along with a big help in understanding the life behind and around the music." "This is an important book, grand in scope and scale, and grand in its impact. . . .Harry Bolick, with the assistance of Stephen Austin, easily captures honors for THE book on regional old-time music for the second decade of this century. Mississippi Fiddle Tunes and Songs from the 1930s is a must-have for anyone interested in American old-time music." "Designed for fiddlers and folk music enthusiasts who want to work from accurate transcriptions of authentic, field-collected music from an earlier era, Mississippi Fiddle Tunes and Songs from the 1930s is an important addition to an under-represented part of American folk music, namely printed transcriptions of regional tune repertoires. Further, the description of the Library of Congress collecting trips to Mississippi, along with representations from the collectors' field notes and photographs, will interest the historian and tune collector."